NETWORK FINALS: THE OSCARS ended up at 10.5, down a fairly small 0.3 from the 2015 telecast. Interestingly, in the final national numbers, the rating was basically steady through the telecast, without the bump in the first half-hour that was evident in the overnights. The LIVE FROM THE RED CARPET pre-show was rated as separate half-hours and adjusted to 2.6/4.0/5.9. CABLE HIGHLIGHTS: Not many cable networks wanted to do battle with the Oscars, but THE WALKING DEAD pressed on, although even that behemoth dropped half a point to 6.08. 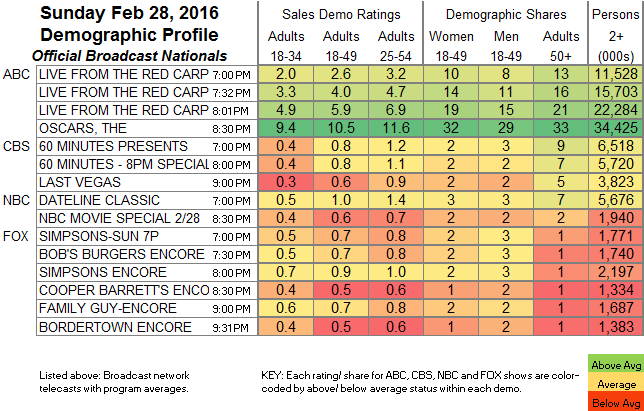 TALKING DEAD followed, down 0.45 to 2.23, and COMIC BOOK MEN actually ticked up to 0.36. E!’s LIVE FROM THE RED CARPET pre-show was at 0.73. Adult Swim’s VENTURE BROTHERS was down 0.04 to 0.53. On History, AX MEN slipped 0.03 to 0.43. Food Network’s GUY’S GROCERY GAMES dropped 0.03 to 0.36, ALL STAR ACADEMY fell 0.05 to 0.32, and CUTTHROAT KITCHEN lost 0.11 to 0.30. 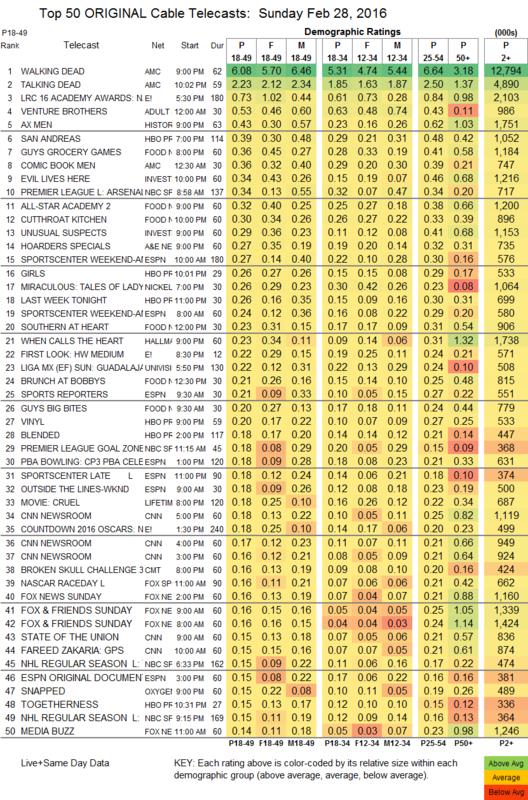 The weak night brought some unusual networks to the Top 10, as ID’s EVIL LIVES HERE and an NBC Sports Network PREMIERE LEAGUE soccer match were both at 0.34. HBO may have thought that the absence of original Showtime series would compensate for the Oscars competition, but the results were minimal: GIRLS gained 0.03 to 0.26, but LAST WEEK TONIGHT fell 0.08 to 0.26, VINYL dropped 0.07 to 0.20, and TOGETHERNESS was steady at 0.15. Hallmark’s WHEN CALLS THE HEART ticked up to 0.23.